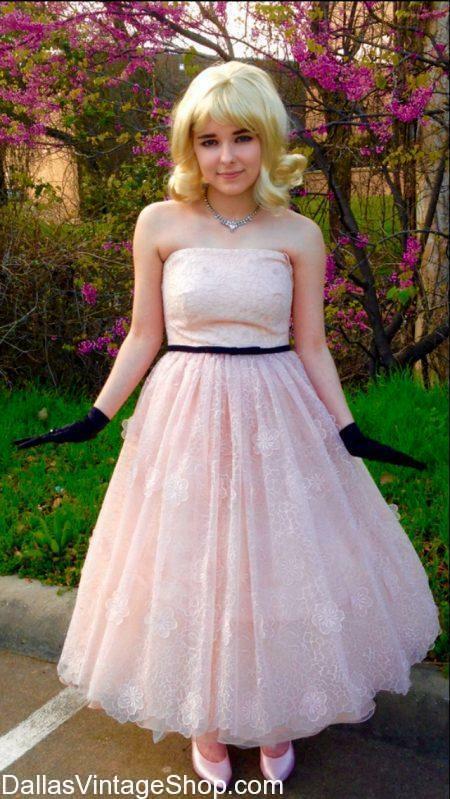 Valentine’s Formal Dresses from Dallas Vintage Shop come in Tea Length, Full Length, Formal and Semi-formal Fashions. This Fresh & Flirty Tea Length Formal Dress, shown here, is accented with a Vintage Princess Rhinestone Necklace & Day Gloves. This Formal Tea Length Chiffon Dress is perfect for Valentine’s Dances, Sweetheart Banquets and other Special Occasion Valentine’s Proms and Formal Events. We have a vast and varied collection of Valentine’s Formal Dresses. You will find Sleek & Sophisticated Formals, Princess Poofy Tea Length or Full Length Styles, Retro & Vintage classic Formals to Ritzy Beaded Gowns. Our Valentine’s Formal Accessories are unbeatable. If you already have a Valentine’s Formal Dress then you will definitely want to accessorize with our Glitzy or Period Jewelry & Wraps. We have any Style of Jewelry from Romantic Red & Ruby gemstones to Pink or AB Rhinestone Vintage Classics.